So, which stove has the fastest boil time? Or does it even matter? If you read my reviews, you'll notice that I don't normally list boil times. Why do you suppose that might be? First, how important is it? Something in the neighborhood of 5 to 7 minutes to boil a liter is fine in my book. Waiting another 30 seconds or so for a boil makes no real difference to me. Now, if it were another 3 minutes, maybe then I'd worry about it, but half a minute either way isn't going to really affect how I cook or how I organize my time while backpacking. After all, isn't one of the reasons we go backpacking to get away from all of the arbitrary time pressures of "civilization?" 1. Turn it down! High heat = inefficient = wasted fuel. 2. Use a lid. Escaping steam = escaping heat = wasted fuel. 3. Use a windscreen. No windscreen = dispersed heat = wasted fuel. Running a stove on high burns through more fuel than you really need; you can accomplish the same with less fuel if you just run it on a low to moderate flame. You are carrying that fuel on your aching back, aren't you? Shoot! Conserve it. Why worry about shaving 30 seconds off a boil when the price is to carry more fuel? 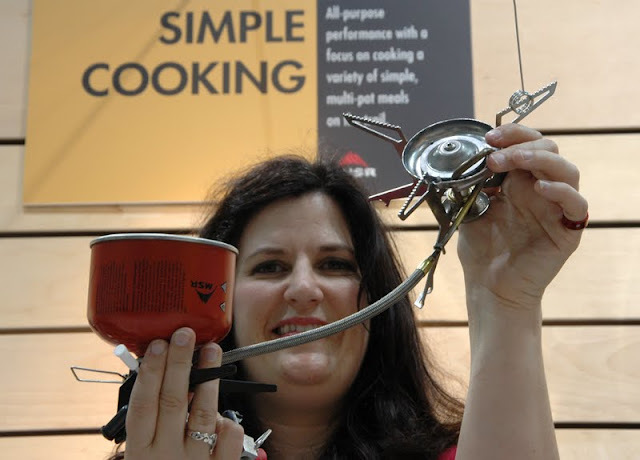 Third, how helpful is a boil time in comparing one stove to another? There are no standards for boil times. If there were a standard (e.g. 1 liter of water at 45F/7C, 5mph/8kph wind, plain aluminum pot with lid, 1 atmosphere pressure), then we could compare boil times stove to stove and perhaps have something meaningful. 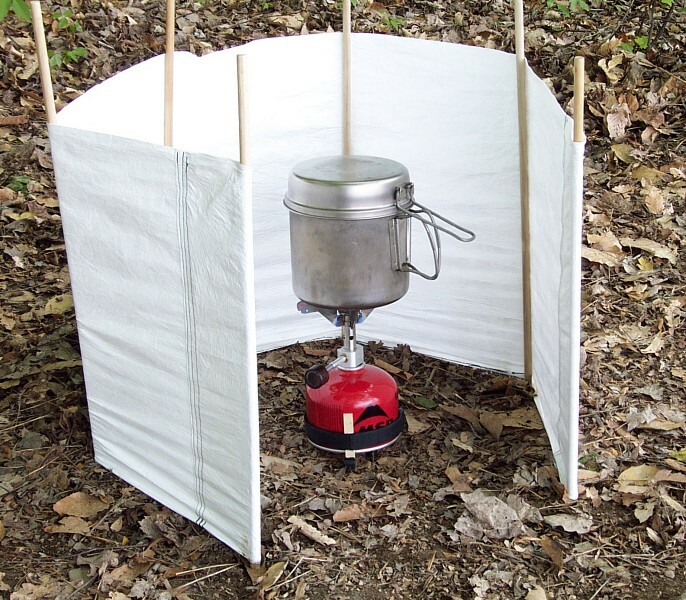 But there is no standard, so one stove company may be boiling water that is 45F/7C outdoors whereas another company may be boiling water that is 75F/24C in a windless laboratory. That's like comparing a diesel truck to a skateboard. One stove manufacturer may have its facility in Denver, Colorado (elevation about 5000'/1500m) whereas another may have its facility in Chicago, Illinois (elevation about 600'/180m). Comparison of boil times from those two locations isn't even close to relevant. So, to my point of view, a boil time doesn't figure prominently as I evaluate a stove. Sure, it has to be within reason, but even 60 seconds either way wouldn't have any significant effect on my enjoyment of the outdoors. Not only that, if I start focusing on maximizing my boil times, I'm just burning through fuel -- fuel that I have to pack. And finally, since there is no set of standard conditions for boil times, they're of little use for comparing one stove to another. Don't forget that boil times vary even on the same stove. If one boil takes 4:45, 5:15 the next, 4:35 the next time, and then 5:05 on the boil after that, a stove company will probably pick the single fastest time and list that as their official boil time. Singularly useless. To me at least, boil times are just the "macho" claims of stove advertisers. Within reason, boil times aren't really important to a guy sitting by a beautiful alpine lake trying to get away for a while. So, don't sweat the boil time. Look at how you cook, what you cook, and under what conditions you cook. How a stove serves you in the context of how you do things in the outdoors is going to matter a whole lot more than 30 seconds off your boil time. I happen to like my old Hank Roberts stove, a stove that dates back to the 1960's. It's in very nice condition. I have the Mark III version. So compact! And inside, the original accoutrements that came with the package. 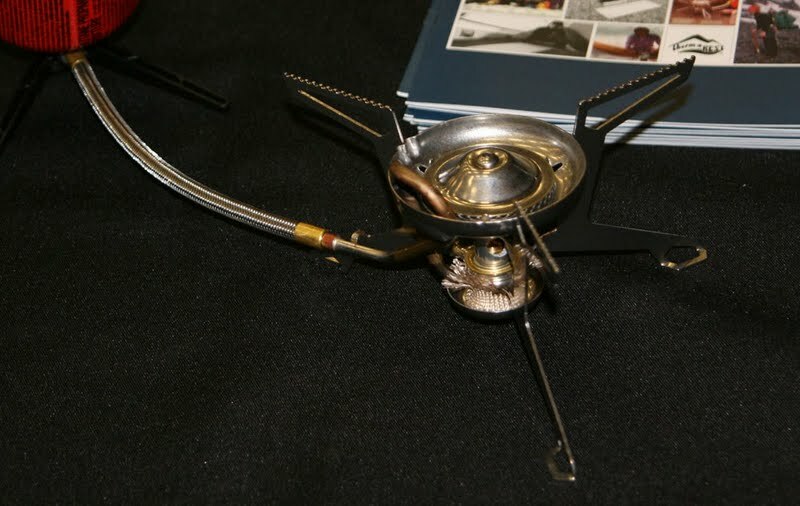 Unfortunately, it's been some years since either the stove or its proprietary fuel canisters have been produced (see The Hank Roberts Stove -- With a Proper Canister for information on and photos of the original canister type). Therefore, to the original contents, I add a few "essentials," all of which are easily contained within the outer shell of the stove. Now, you probably recognize the Bic type lighter, but what of the other items? Now, let's take a look at the stove itself. That little discus you saw earlier? Here's what it looks like assembled. Pure genius. Do you see that brass "needle" to the right? That needle fits into a "rosebud" on a proprietary canister. Such canisters are alas no longer made. Here's where Henrik's adapter comes in. The adapter slips over the needle. And voila! here we are ready to cook. Did someone say "cook?" Now, where would we be without some flame shots? A very nice, efficient blue flame. The Hank Roberts Mini Stove (Mark III) really has a good strong flame. The original proprietary canisters contained a wick. The wick conducted liquefied gas into the burner. Liquid did you say? Why then we ought to be able to invert the canister and be able to run the stove in liquid feed mode. Indeed, we can do just that. Be sure to let the stove warm up before inverting the canister. If you don't let the stove warm up a bit first, the stove will flare. Running a gas stove in liquid feed mode allows one to operate a gas stove in much colder temperatures than in conventional upright (vapor feed) mode. As they say, "the proof of the pudding is in the eating," so it's time for the "tea test." Handily passed. And if tea test, then tea. Hank Roberts Mini Stove: Highly Recommended (considering its era). It looks like MSR is putting out three, count 'em, three new stoves. UPDATED 9/6/2011 See also this related post which contains videos of the new MSR Whisperlite Universal. The first is the MicroRocket. Basically, the MicroRocket looks like it's just a lighter version of the PocketRocket, but with some minor improvements. In particular, the pot supports are shorter and supposedly (per MSR) stronger, which would go a long way toward correcting the PocketRocket's Achilles heel. Reportedly, the MicroRocket will be 15% lighter than the PocketRocket which would mean that the MicroRocket would weigh about 2.5 oz. A German press release I saw lists the weight at 75g which would be 2.6 oz. Either way, it's a very nice, light stove. A second "improvement" is the addition of a separate piezoelectric starter (see first photo). The starter is a stand alone unit not built into the stove. I'm not quite sure about the utility of this. Why not just bring matches, a lighter, or a firesteel? Matches, a lighter, or a firesteel seem like they'd be a lot more versatile. 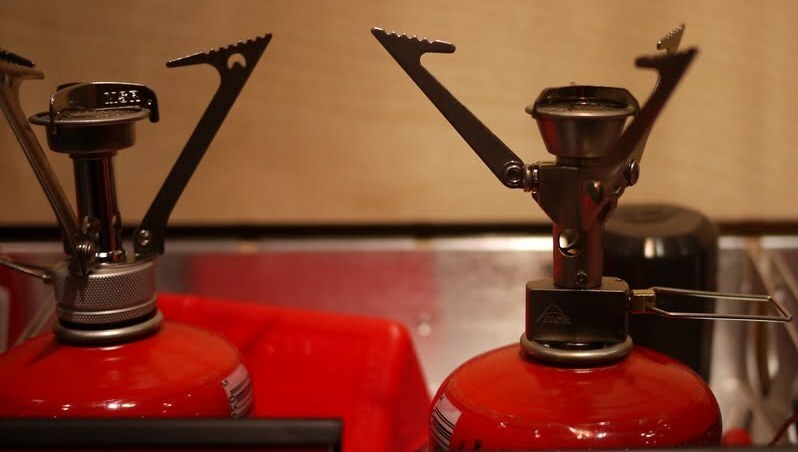 With matches, a lighter, or a firesteel, one can light a variety of fires, not just a stove. I haven't seen MSR's piezoelectric starter, but I think a piezoelectric starter would only work on a stove. It'll be interesting to see if their separate piezoelectric starter catches on. 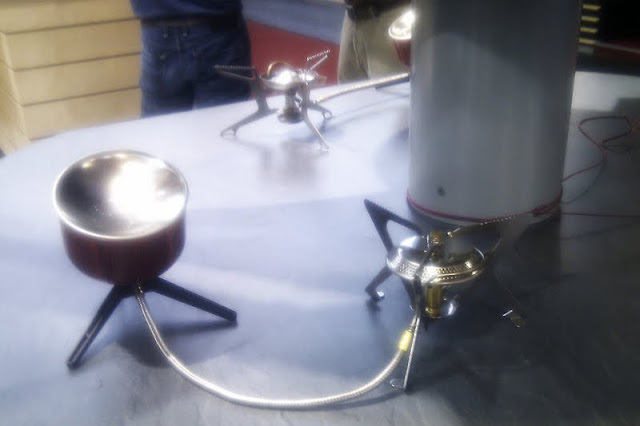 The pot supports on the new MicroRocket fold up a bit differently and the valve control folds over the body of the stove. It all collapses down into what looks to be a very compact package indeed. The new case for the MicroRocket looks more compact overall when compared to the case for the PocketRocket. 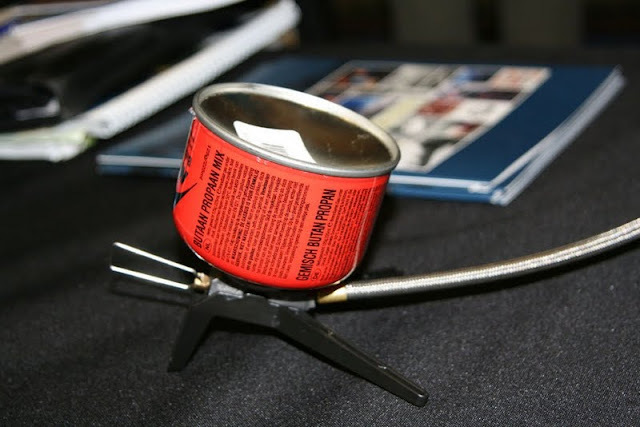 The second new stove is the Whisperlite Universal which is a "hybrid" stove (MSR's words) that will burn both liquid fuel and gas. Apparently the Universal is a Whisperlite Internationale with significant revisions. Gone are the wire legs, and the generator has been significantly revised. Note also the black plastic canister stand which holds the canister upside down. 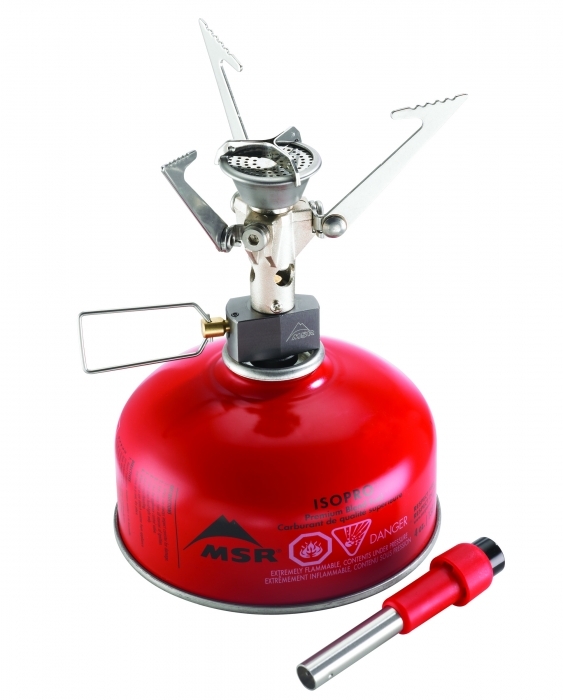 It appears that MSR is finally conceding that their remote canister stoves work with the canister inverted (i.e. liquid feed), a fact that they have mysteriously downplayed for years. 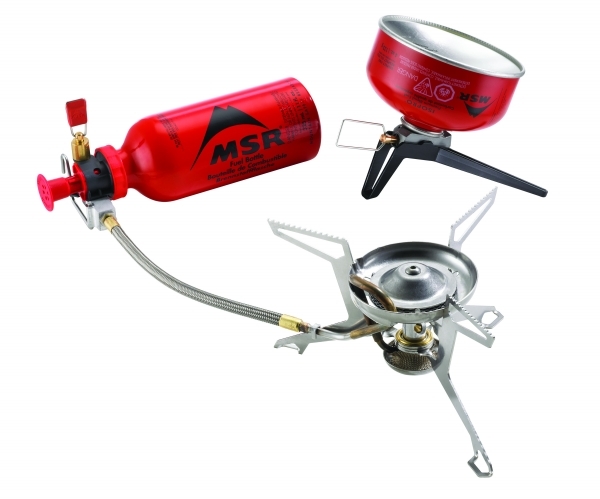 It's a wonder that MSR wouldn't market the heck out of the fact that their remote canister stoves can operate with the canister inverted since an inverted canister stove can operate in temperatures at least 20 degrees Fahrenheit (about 10 degrees Celsius) colder than conventional upright canister stoves. 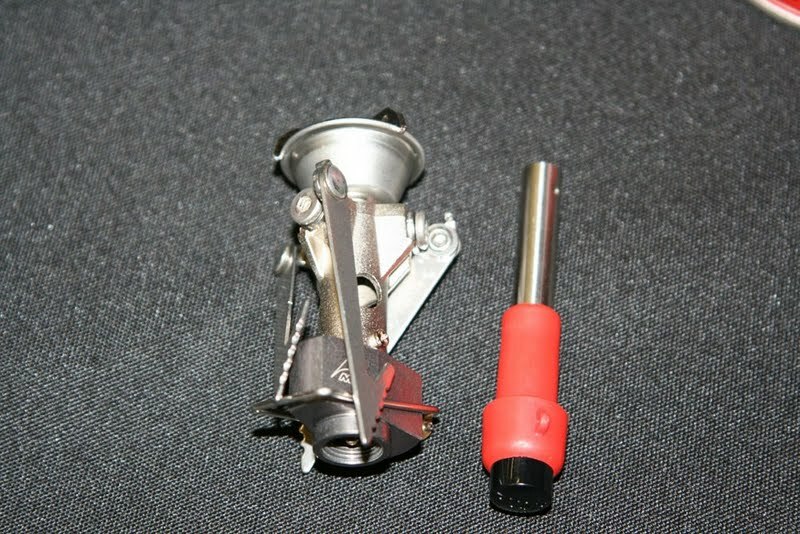 The Whisperlite Universal supposedly has multiple connectors that can be swapped out for use with gas or liquid fuel. 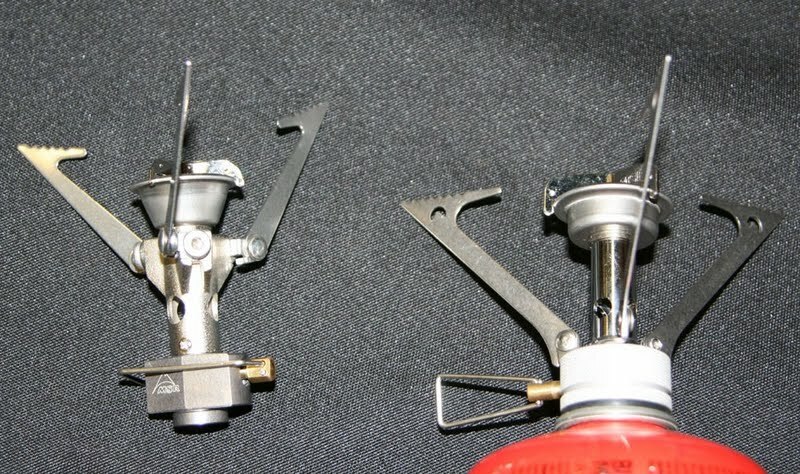 The Whisperlite Universal comes with three jets (much like a Primus Omnifuel) for use with differing fuels. 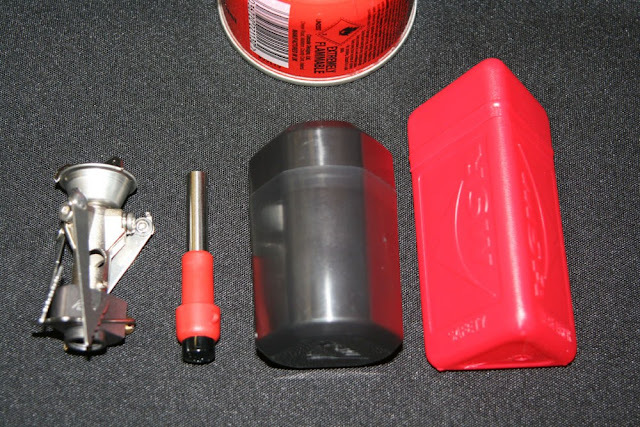 From what I can see so far, this new Whisperlite should be a very interesting stove capable of a wide variety of modes: upright (vapor feed) gas, inverted (liquid feed) gas, and liquid fuel (white gasoline or kerosene). Let's hope that they have not only added a new fuel to the old Internationale's repertoire but also increased the Internationale's reliability with kerosene. If in fact the Whisperlite Universal does have increased reliability with kerosene, the Universal might indeed be a really good choice for the world traveler, particularly if the Universal were more accessible from a price perspective. Stoves currently on the market that burn gas, white gasoline, and kerosene tend to be pretty expensive. The new Whisperlite Universal seems to have an upgraded fuel line. 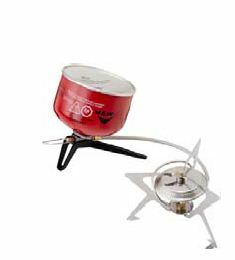 The fuel line on newer MSR stoves like the Simmerlite and Windpro is thinner and more flexible, making the stove easier to pack. It looks like the Whisperlite has now also been upgraded to the new more flexible fuel line. Assuming the new fuel line is just as reliable as the old one, the more flexible fuel line is a change I heartily applaud. It's possible, but I don't know this for a fact, that the new Whisperlite Universal will be a lighter stove than either the regular Whisperlite or the Whisperlite Internationale. I say this just based on the legs and the overall look of the stove. Of course, any weight shed on the legs may be regained depending on how they do the connectors. Assuming that the new Whisperlite Universal uses the standard MSR duraseal pump (look at the photo below; notice the duraseal pump in her hand), there will have to be some kind adapter that the fuel hose will plug into so that a either a standard pump or gas canister can be attached. MSR is smart, they have made the Whisperlite Universal so one doesn't have to carry the canister stand in warm weather, when you really don't need to invert the canister. Lastly, the third "new" stove: The Windpro II. MSR has improved the Windpro by adding a rotating coupler and including a canister stand that holds the canister in inverted position. Again, it looks as though MSR is finally publicly acknowledging that their remote canister stoves can be used in inverted canister mode (liquid feed). It's interesting to me that it took them this long to acknowledge what has been there all along. They spent a lot of money on the Reactor, which they push as a high end mountaineering stove, when they had a gas stove that would work in much colder conditions way before anyone even thought of the Reactor. Here are a couple of photos of the new, improved Windpro II. In the first photo, note the MSR Whisperlite Universal in the background which appears to use the same canister stand. Perhaps no changes are being made to the regular Whisperlite? All of the new stoves should be available in January 2012. This is a self standing windscreen made by Olicamp. I discuss my preferred windscreen set up in my article, and I'll go into some more detail later on in this blog post, but for now I'd like to discuss some of the alternatives that are out there. Before you look at these alternative windscreens, you should carefully read my article and all of the safety warnings in the article. Using a windscreen with a canister stove can be very dangerous. Make sure that you monitor the temperature of the canister frequently with your hand. If the canister feels hot, it is hot: Take immediate steps to cool the canister. DO NOT EVER LET THE GAS CANISTER OF YOUR STOVE GET HOT*. One particularly ingenious light weight idea is Jim Wood's Kite Screen. The kite screen has an excellent reputation and is definitely a workable solution to the wind challenge. For me personally, the kite screen is a bit more set up than I like to mess with, but many people really like it. By the way, if you haven't checked out Jim's site, it's worth a look. Lot's of valuable information. Recommended. The canister is fully vented making it very unlikely that you'll overheat the canister. Since the windscreen doesn't need to reach all the way to the ground, a shorter windscreen can be used. It's a little hard to secure the windscreen on top of the radiation shield. Wind tends to knock the windscreen around. However, I've seen lots of examples of clever clips and other means to secure the windscreen in place. This is definitely something worth experimenting with. The lip on the radiation shield tends to get bent up when in my pack. A completely flat radiation shield is easier to pack. Because there is such a tight mating of the windscreen and radiation shield, it's going to get really hot inside the windscreen. Plastic or other sensitive parts like piezoelectric ignition systems could get damaged. Because the radiation shield needs to securely support the windscreen, you'll need to use a little bit heavier material for the radiation shield than you otherwise would. Since the valve control is inside the windscreen, you have to lift or open the windscreen to adjust the flame. If you're just boiling water, who cares? Just turn the stove on and let the danged thing boil. But if you're simmering, you may need to adjust the flame. A huge deal? No. Inconvenient? Yes. Another option is to take a titanium bowl and cut slots and holes in the bottom of the bowl such that the burner and pot supports protrude through the bottom of the bowl. I think the bowl idea has a lot of merit. Of course you have to sacrifice a titanium bowl, and it takes a bit of skill to make cuts that don't look really amateurish. The bowl in the photo was made by Denis Hazelwood. 3. It's tall enough that it can handle larger canisters and larger stoves. 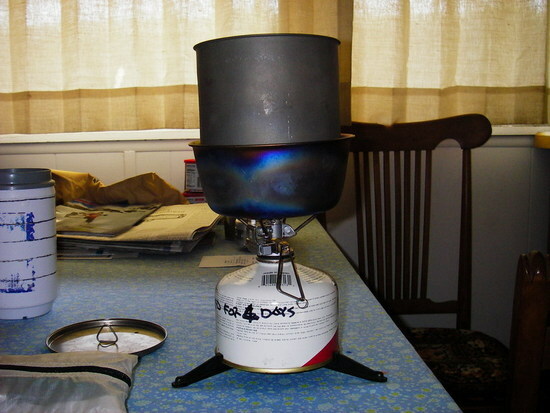 The canister in the photo is a 220g Snow Peak canister, and the stove is an MSR Superfly, a relatively tall stove. 5. The rods that act as hinges can be pushed into the ground to help secure the windscreen. BUT this type has a significant disadvantage: it's heavy, weighing in at 201g (7 ounces) which is about the weight of a 110g sized fuel canister (when full)! The above windscreen is significantly lighter, but far more subject to being knocked around or blown over by wind. You'll probably need to brace the windscreen with rocks and such. The above windscreen is also significantly less durable. But it does work. For any of the common windscreen set ups, your imagination is the only limit to the types of materials that you might use. Items such as pie tins, 36 ga. aluminum tooling fool, baking pans, catering dish lids, titanium bowls, household aluminum foil, roof flashing, etc. are all fair game. Just remember: DO NOT EVER LET THE GAS CANISTER OF YOUR STOVE GET HOT*. With that in mind, get out there and use your stove for what it is intended for: Good eats!! 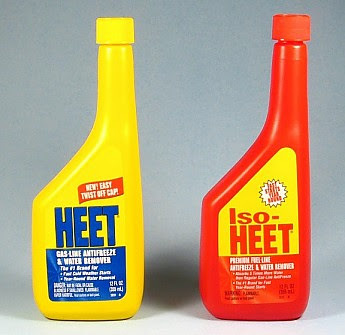 *Letting the canister get some heat in cold weather isn't a bad idea; it will improve performance. You still need to monitor the canister's temperature even in cold weather. Even when it's cold out, that canister must never be allowed to get so hot that you can't comfortably touch it with your bare hand. I'm talking about "normal" hands here. Be careful if your hands are really cold. Really cold hands may not give you enough sensation to tell how hot that canister really is. Let your hand rest on the canister a while. If the canister is really hot, you'll know it soon enough! My point is that a quick touch with cold hands may not be enough. Check the canister.